Ped Eggs precision micro-files gently remove callused, dried skin from feet. Ped Eggs precision micro-files gently remove callused, dried skin from feet. Keep your feet smooth. I have had a ped egg since they were first introduced. The blades do not wear out fast so I had a lot of use out of the original. I started to look for the replacement blades. I finally found them. I can now feel confident that I can remove my callouses from my feet without being able to replace the blades from the original package. the pedegg is the greatest for quickly and painlessly removing callouses on my feet. I have tried so many other products in the past and this one is the only one that works and is effective plus affordable. Keep my feet smooth. However, it was on back order and I only got half my order. 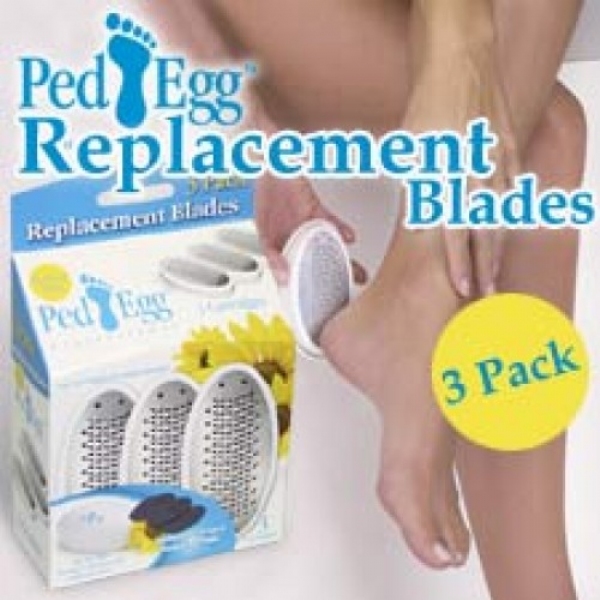 The PedEgg Blades last an incredible long time and does the job complete making your feet smooth and in less the time.